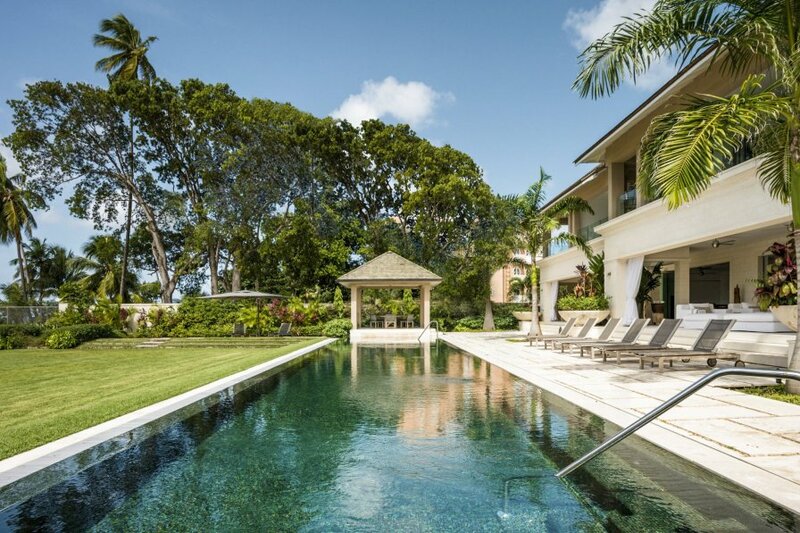 Godings villa is an exceptionally designed gated holiday home in the parish of St Peter, Barbados. Godings villa is an exceptionally designed gated holiday home in the parish of St Peter, Barbados. The home benefits from a clean and modern design both inside and out that utilises some of the island's most exquisite materials. Some of the home's most exciting features include an in-house gym, a glass-walled study and a home cinema. You'll definitely be able to enjoy this beautiful island without even leaving your home. The living and dining room sit adjacent to each other in a stunning open plan design. The area is designed in neutral colours with limestone floors and contains striking pieces from designers Maxalto, Christian Liaigre and Ralph Lauren. The dining room boasts a grand Whetstone Oak table decorated with white roses and elegant tableware. This is the perfect space for upscale dinner parties. Guests can enter the first floor via an impressive double staircase. Upstairs, a number of the bedrooms feature four-poster beds and Ralph Lauren bed stools. All of the bedrooms incorporate a walk-in dressing room, lovely terrace and en-suite bathrooms embellished with attractive mosaic tiles. Godings sits on 1.2 acres of landscaped gardens that are magnificently enhanced with palm trees, shrubs and an immaculately kept lawn. The gardens contain two dining areas where guests can savour eating al fresco and a path that leads straight onto the beach. Morning walks on the beach will become your regular wake up call. A private mosaic-lined pool lies in the garden and allows you to swim while taking in awe-inspiring views of the horizon. While staying at Godings, your house manager will be on call to help you get the best out of your holiday. Fine dining experiences, thrilling water sports activities and educational day trips can all be arranged efficiently by your house manager who is familiar with the island's leading activities and attractions. Godings Villa is a particularly striking 5-bedroom beachfront villa. The villa has a private infinity pool and a host of fantastic staff who will make you and your guests stay unforgettable. While staying on Barbados' stunning coast, it would be a crime not to sample some of the island's fresh sea cuisine. Six Men's Fish Market is located nearby and is a hot spot where locals and tourists purchase their tasty catch of the day. Serving everything from tuna, marlin, flying fish and dolphin, the market will definitely serve up something new for you to try. On Fridays, the market transforms into the party place to be. A rum shop that sits beside the market blasts out music and serves beverages. Arlington House is another close by attraction that is certainly worth a visit. The house is a museum set over three storeys that centres on local and slave history. Arlington is an eighteenth-century building that has been restored to provide visitors with an interactive experience. A friendly member of staff will guide you through the museum, explaining how the interactive features work and how to use them. There's also plenty of audio and film information as well as striking displays to help you journey into Bajan history. For a wonderful dining experience, head to Port St Charles Yacht Club, a restaurant that looks out onto the mesmerising west coast of Barbados. Offering a plethora of international dishes, guests will find something to suit their fancy, even if it means trying something that they've never heard of before. After your meal, head onto the venue's deck and lounge in the sunshine while sipping on a delicious cocktail or two.